and hope you can find a home here with us. Our mission statement from Matthew and our website name reveal who we are: a congregation full of life and dedicated to shining our light for Jesus Christ. At Epworth, we believe that we come close to God and God’s desire for us through worship, prayer, study, outreach, service to our communities, and mutual support. Epworth is a diverse congregation and proud of it. We are old and young, long-time and new Christians, and those just exploring the faith. We come in all sizes and colors. What binds us together is a common faith in God, a desire to grow in that faith, and an excitement about shining our light for Jesus Christ with others. Whether you are a long-time church goer, or have never been in one before, you are welcome here! Whether you are full of answers, or full of questions you are welcome here! Our hope for Epworth is that it will be a place where you can wrestle with complex issues, voice your doubts, ask your questions, and offer praise to God! We want it to be a place where you can shout with joy, or weep in pain, a place where you can experience hope, love, healing, and transformation. Epworth has many ways for you to get involved, and a myriad of ministries to fit every need. If you have any questions, please be in touch! Pastor Bill and Pastor Kate are always excited to get to know you and your story. We invite you to explore our web site. 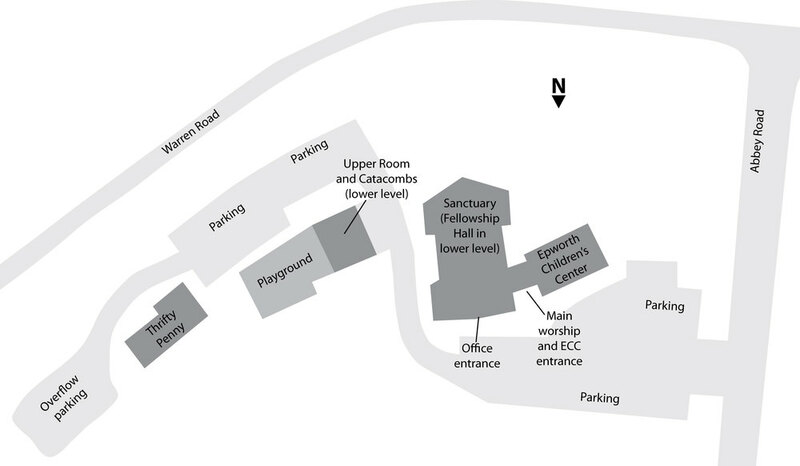 A map of our campus is available above.